Why would my pet need a food-dispensing toy? Our modern lifestyles have impacted our dogs and cats. Many pets show some signs of obesity. In order to prevent and control obesity, it is advisable to ration your pet's portions and provide him with some form of physical activity. Interactive feeding toys including Busy Buddy and SlimCat will do just that. They help your pet fight obesity and maintain a healthy weight by encouraging him to work for his food and by rationing his food. About 50% of cats show signs of obesity. 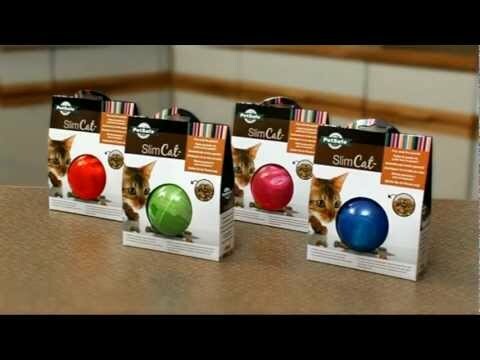 SlimCat™ feed ball interactive feeding toy gives your cat portion control and exercise. The toy increases feline activity, decreases excessive eating and improves behavioural problems associated with boredom such as excessive meowing, scratching or aggression. The toy distributes an adjustable amount of dry food as your cat plays with it. By providing smaller portions of food throughout the day, it helps to maintain optimum weight as well as improve your cat's digestion. It's great for cats of all sizes, especially overweight cats. Fill with a healthy portion of dry food and watch your cat shape up on his own!